Powers/Abilities: None. He's just your average, everyday, talking marsupial. History: In a world where some animals can talk (I'm not sure of how or why), Captain Koala makes friends with "Jolly Joker", an agent of A.S.S. (Australian Security Service). 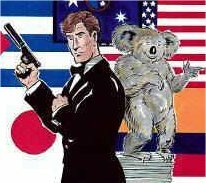 Jolly is investigating a smuggling ring, run by Slambam, a camel, which is bringing guns into Australia through the National Park Captain Koala lives in. When Jolly fails to catch them there, he returns to the city to try and pick up their trail, and the koala, having never left the National Park where he lives and curious about city life, decides to accompany his new friend. Tracking the smugglers takes them into the outback and a final shootout atop Ayers Rock. Since then Captain Koala has continued to help his friend Jolly on a number of cases.